I'm definitely drawn to the classics, and I don't think it gets any more classic than black and white. My white skinny jeans are a spring/summer staple for me, and mine have been getting quite a bit of use over the past couple of weeks. I've worn them with a basic tank, an oversized gray tee and just about every blouse I own. I love how the shoulder cutouts in my blouse add a modern twist to a classic look. I hope everyone had a great weekend! I have similar pumps, they're divine! love this top and your jewelleries!! Oh my, I looove the bracelet, I will definitely check out their stuff, thanks for the tip! You look lovely!! Great pants! So pretty and classy :) I am loving that bracelet, checking out the Etsy store now! Amazing look---so classic and chic! You can never go wrong with classic black and white! I LOVE the cutouts in your top, Audrey! So pretty! Black and white will always be my favorite color combo. Casual Glamorous is the perfect way to describe your style! Love it!!! I love the cut-out blouse! Looks great over skinnies! yes so classic with the black and white! and I love that little touch of color with the bracelet!! Super cute look! Love your blouse! I finally bought a pair of white skinnies!! Can't wait to style them!! I really like that your jeans still seem to have a bit of room rather than being super tight! J brand just kills it with their well-cut styles, don't you think? Hello, I love your dress is fantastic outfit. Your shirt and jeans fantastic. and your shoes love it. So pretty!Love the top and the shoes! Love a classic black and white look and I really like the cut-outs on the shoulders of the blouse. I love your shoes!!! They are amazing!!!! I was just thinking about how I need to get me some white skinnies for the summer. This obviously confirms that fact! I could wear black everyday, its just so chic. Love that top! absolutely gorgeous! love the bracelet! I love your hair straight - it looks so beautiful! This outfit is fabulous too. Don't you love Etsy? I spend hours perusing & shopping...bad habit. Hope your week is off to a fab start! I adore black and white as well...always chic...and seasonless in my opinion. YOu look beautiful..LOVE those shoes!!! Not sure what you have done differently with your hair but it looks gorgeous Audrey!!! Gorgeous again! Great style, Audrey!!! I just stumbled upon your blog. I always say that simple style is the best style and this outfit is just that! Loving the black and white. So classic and chic. Very YOU, really. Your style is effortless and you always look stunning. 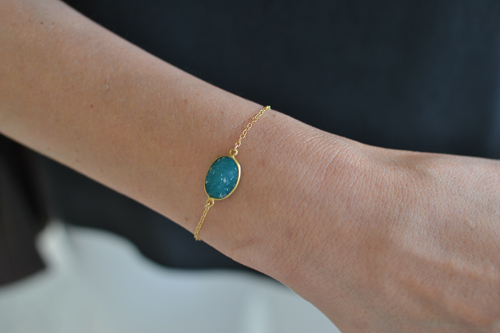 Such a delicate bracelet...esp that pretty turquoise colour. Looking gorgeous lady! I love the black and white combo and your hair looks amazing. love wearing black with my white skinnies!